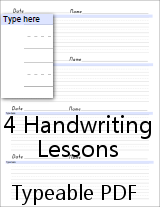 The handwriting practice worksheets on this page use the precursive font made by BJU. See the illustration below. Related: Math Paper - The "Show Your Work" math paper uses this font & supplies a brief daily number handwriting practice. You can type one line per lesson group on this Typeable PDF. Typeable PDF Infomation: Typeable PDF's are meant to be typed in, then printed. Unless you have the full version of Adobe Acrobat and use the typeable pdf's in Adobe Acrobat, the text that is typed will not be saved. Remember, if using Adobe Reader- type and print the Typeable PDF, don't save, come back, and find your work gone. See also this Blog Entry regarding the compatibility of the typeable PDF files. This is a folded nature journal. It asks such questions as, "What do you see?, smell?, hear?"